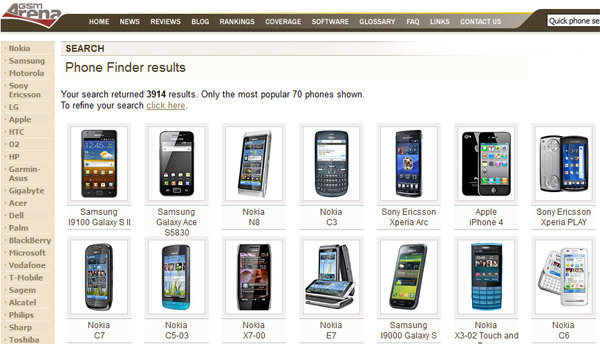 We’ve added searching by several new criteria – the ones that are probably most important in picking your next cell phone. You can now filter the nearly 4000 handsets in our database by processor clock speed and number of cores, as well as available RAM and internal storage. The display part of the search has also been updated so you can now specify ranges for the search, rather than just minimum requirement. So if you find handsets with four-something-inch displays too large for you to handle you can now filter them out of your search results. Other than that the Phone Finder will continue working as usual – you’ll get a list of all handsets that tick the boxes in your search listed by popularity. You can now go ahead and give it a try. Just don’t forget to drop us a line in the comments section below and say if you find the changes useful or not. Oh, and should you encounter any problems, please report them too, along with your browser version.